Barcelona and Spain goalkeeper Victor Valdes is set to miss this summer's World Cup after suffering anterior cruciate ligament damage in his knee. 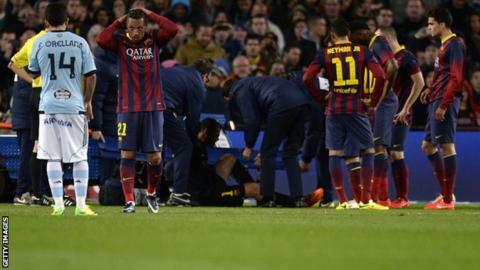 The 32-year-old was taken off on a stretcher early in Barcelona's on Wednesday. Barcelona later confirmed he will have surgery on Monday. Valdes has likely played his last game for Barcelona, having already announced he will leave the club when his contract expires in the summer. "We won't sign a goalkeeper. We will finish the season with this group," Barcelona coach Gerardo Martino said. "I am not one to believe in bad luck, but at this stage of the season I thought everything that was to happen had already occurred. I was wrong. "It's a big blow but this team has rolled with punches for some time now and we will pull through this." He suffered the injury 22 minutes into the game at the Nou Camp, shortly after denying a Celta Vigo free-kick. Valdes, who has spent the last 12 years in the Barcelona first team, had been expected to compete with Iker Casillas for a place in the Spain goal at this year's World Cup but is unlikely to be fit for the Brazil tournament. England forward Theo Walcott suffered an ACL injury in January, ruling him out of action for six months. It is the second injury Valdes has suffered this season, having injured his calf as Spain lost 1-0 to South Africa in a friendly last November. That injury saw him miss eight games for Barcelona.